Are you driving this Thanksgiving? AAA predicts that there will be 48.7 million people on the road between today and Sunday. That’s a 1.9 increase from the number predicted last year, equivalent to an increase of one million drivers! 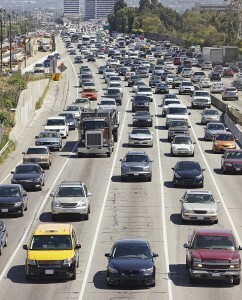 The lower gas prices mean that there are likely to be more drivers on the road this year. Thanksgiving is already the most highly traveled time during the year, and most DUI arrests are made between Thanksgiving and New Year’s. AAA also predicts having to rescue over 370,000 drivers this year during the Thanksgiving holiday. With such dangerous conditions on the road during this time of year, it’s especially important for truck drivers to be alert and safe on the road. Distracted driving is dangerous on the road, especially during the holidays. It’s a good idea to drive extra carefully and make sure that you are not distracting yourself by changing music or using apps while you’re driving. If you need to make a phone call, play it safe by pulling off the road to make the call instead of making the call while you’re driving. If you haven’t gotten enough sleep and feel like you can’t stay awake, pull over immediately! It’s better to stop for a power nap than to push yourself and get into an accident. In addition to having to deal with more reckless drivers on the road, you’ll also have to be more vigilant with your cargo during the holiday season. According to FreightWatch International, a cargo theft recording firm, cargo thefts are expected to rise during the holiday period. Thieves will be especially targeting trucks carrying electronics, clothing, and shoes. Last year, there were 18 cargo thefts in which $1.5 million worth of merchandise was stolen. You can protect against cargo theft by making sure that your security protocols are up-to-date. Whether you are looking to upgrade your fleet to electric trucks or simply interested in the latest electric trucking technology, you can rely on Baltimore Freightliner-Western Star. We have provided top-notch service for the trucking industry for 30 years and would love to assist you in buying a new top-of-the-line truck, finding the specialty parts you need, or repairing your truck. Give us a call toll-free at 800-832-7278 or locally at 410-685-4474, or contact us online. To find out more about what we are up to, follow us on Facebook, Twitter, Pinterest, and Google+. This entry was posted on Friday, November 18th, 2016	at 8:24 pm	and is filed under Trucking Lifestyle	. You can follow any responses to this entry through the RSS 2.0	feed. Both comments and pings are currently closed.